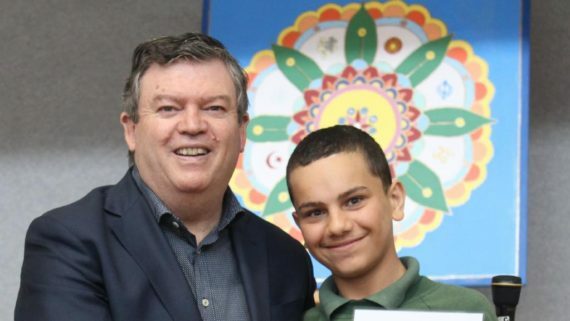 Frank McGuire at St Dominic’s School in Broadmeadows with student Joseph. Put simply, it’s time to turn postcodes of disadvantage into Postcodes of Hope. More than a month has passed since I outlined these concerns, proposed remedies and identified more than $1 billion in unspent funding that could be harnessed, in letters to Prime Minister Malcolm Turnbull and federal Industry, Innovation and Science Minister Greg Hunt. Evidence and urgency is compelling. Australia is one of the richest nations, Melbourne is acclaimed as the world’s most liveable city but postcodes of disadvantage are bearing a greater burden and complexity. The critical insight into poverty, unemployment and crime is that a quarter of prisoners come from just 2 per cent of postcodes. This disclosure from Dropping off the Edge, the Jesuit Social Services report in 2015, was reinforced by Victorian Ombudsman Deborah Glass, highlighting the well-evidenced link between disadvantage and offending. Such issues are too important for partisanship. The political system must change to avert a social catastrophe. Opportunities are significant, but the challenges are daunting if the lack of a co-ordinated plan prevails. This is vital for Melbourne’s north, where one in 20 Australians is predicted to live within two decades. In Creating Opportunity: Postcodes of Hope, I’ve delivered a plan harnessing assets including the most affordable land within 20km of Melbourne’s CBD, blue-chip infrastructure and innovation for jobs. Closure of Ford’s assembly lines marked the end of an era and way of life for blue-collar workers whose sweat and manufacturing nous underwrote prosperity for generations. The company has since announced a strategic investment, turning its Broadmeadows innovation hub into the centre of product development for Asia. 50 per cent to $450 million, with white-collar engineering and design jobs in Melbourne’s north forecast to increase by 400 to 1500. An Australian government initiative, the Automotive Transformation Scheme, was designed to help supply chain businesses survive by finding new markets, but which has largely failed where it was needed most, given the closure of large auto suppliers. My question to the Prime Minister is how much of the unspent $1.324 billion from this scheme will he reinvest in collaboration with the Victorian government or the private sector as a catalyst for jobs and growth in Melbourne’s north, particularly its capital, Broadmeadows, because deindustrialisation in a time of terror is a national concern. The letter to the PM also highlighted the insight the Australian government had into pending danger from the nation’s leading security agency. When former prime minister, Tony Abbott visited ASIO, his photo opportunity identified Campbellfield as a potential hotspot for terrorist recruitment. Unemployment in Broadmeadows rose to 26.4 per cent during the convergence of state and federal Coalition governments. This rate was higher than Spain and equal to Greece — countries suffering the worst jobless rates among developed nations in 2014 and higher than Detroit’s peak of 24.9 per cent in 2009 during the decline of the American automotive industry. the rate of disengagement of 16 to 24-year-olds neither working nor learning in Broadmeadows, which is now the most vulnerable and hardest-hit community following the closure of Ford’s local manufacturing. Broadmeadows has evolved into virtually a united nations in one neighbourhood, with families from more than 160 countries calling Australia home, but is in danger of entrenched enclaves of disadvantage. side by side with Christian refugees escaping the war in Iraq and slaughter in Syria. One of the best anti-radicalisation strategies is a job connecting the disconnected. One of the most effective national security responses is community engagement. Likewise, the best form of welfare is gainful employment. ALP leader Bill Shorten and Australian Industry Group director Tim Piper were keynote speakers at my Economic and Cultural Development conference in October. The crucial partner to complete a unity ticket is the Australian Government, providing opportunity and hope where industries have collapsed.